Gouves, Crete / MMI V (Moderate shaking): I sitting at the pool and thought, that someone shake my chair. As i looking around a lot of people on the pool do and thought the same thing. Cairo, Maadi / MMI II (Very weak shaking): very small up and down movement. 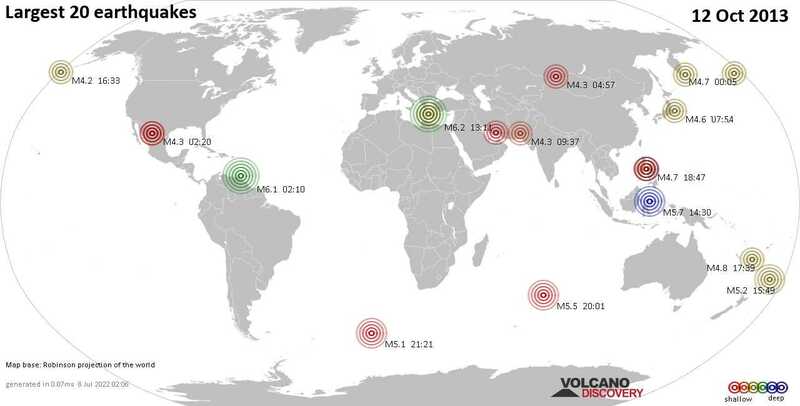 Iguana Beach, 3 km west of Chania (50 km E from epicenter) / MMI VI (Strong shaking): We could see earth move and cars shaking. Lagio (Near Gythio) Peloponnes / MMI III (Weak shaking): Ich habe ein leichtes Schwanken für ca. 10 sek. gespürt und bei der optischen Kontrolle gesehen, dass die Lampen etc. im Haus geschwankt haben. Atlantic Caldera Creta Paradise Gerani Crete (55 km E from epicenter) / MMI VI (Strong shaking): I was sitting by the pool when my chair started shaking. My wife was asleep on a sun bed by the pool and thought I was shaking her chair to wake her up. I got the last few seconds on my iPhone and uploaded it to YouTube. Chania, Crete (67.1 km E from epicenter) / MMI VI (Strong shaking): I was on the harbourfront inside the old mosque. At first I thought I was dehydrated and my legs were shaking, then it felt like a couple of big waves were moving the ground. It lasted 40-50 secs. No panic but waiters told people to leave the restaurants. We saw no visible damage in Chania centre. St.george in Grenada / MMI VIII (Severe shaking): In our boat in marina and I felt the vibration laying in bed.lasted maybe 10 s. felt alarmed but couldn't figure out what it was. st georges Grenada / MMI IV (Light shaking): Woke me up took a while to realise what was happening by which time it was over.